Watch straps are simple and yet at times tricky to actually decide which to wear for a particular occasion. In this article, we'll walk you through some of the best watch straps for the season, exclusively designed by Strap Studio for the Samsung Galaxy smartwatch series. Out with the old and in with the new! The holidays are over and the new year has just arrived. With it are new ideas and bold statements that make 2019 an even better and bigger year, and with more time on our hands (or wrists), we can finally treat ourselves to the finer things in life. Watch straps are one such thing: simple and yet at times tricky to actually decide which to wear for a particular occasion. In this article, we’ll walk you through some of the best watch straps for the season, exclusively designed by Strap Studio for the Samsung Galaxy smartwatch series. Get the right strap for your Samsung smartwatch using our Strap Configurator. When we think of the new year, we envision fresh, crisp, and bright. Wearing colors that reflect the promising new year’s vibes is a great way to its recent arrival. According to the Feng Shui tradition, 2019 is going to be a Fire and Metal year, which, respectively, are represented by red and white. Hence, the lucky colors for the coming year are those that symbolize the element of Fire, ranging from red, orange, and pink, to other colors within the same spectrum, while for those that symbolize the Metal element, white and golden hues fit the best. Strap Studio’s fine collection of premium handcrafted straps are future-ready accessories to the Samsung Galaxy smartwatch series, and their colors range from classic colors for leather (brown, black) and textile (red, blue, green, white, and black), all accented with easy-change metal buckles crafted from aluminum and designed with Strap Studio’s spring bar system to let you switch between different straps in a matter of seconds. Softer colors are available through the Urban Dress Collection for the Samsung Galaxy Watch with the prominence of its gold buckle and buckle tongue, both matching the Rose Gold colorway of the smartwatch. This elegant collection features three colors: Rose (soft pink hue), Phonebox (dark velvet), and Lamb (beige white). A more masculine variation of the design is called Urban Traveller, featuring a leather strap design with a deep black aluminum buckle, a perfect complement to the Midnight Black colorway of the Galaxy Watch 42 mm. Brighter colors are available through Strap Studio’s Nato collection, a set of water-resistant watch straps which come in two-color pairings for the primary hue and accentuation. The colors available are Pink/White, Orange/White, Sky Blue/Pink, Blue/Orange, Green/White, Grey/Yellow. A classic Navy Blue colorway is also available, paired with a all-Black variation for the textile-based watch strap collection. For those looking for transitional colors based on the Spring/Summer collections for 2019, festive colors ranging from orange red, red (plum), vibrant orange (turmeric), golden orange (coral), yellow-green, golden yellow, deep brown (toffee), moss, and a softer lavender-pink combination (lilac) are suggested as creative palettes to choose your clothing colors from. These playful hues express confidence and a free spirit, uplifting your individuality with their vibrance and authentic aura. 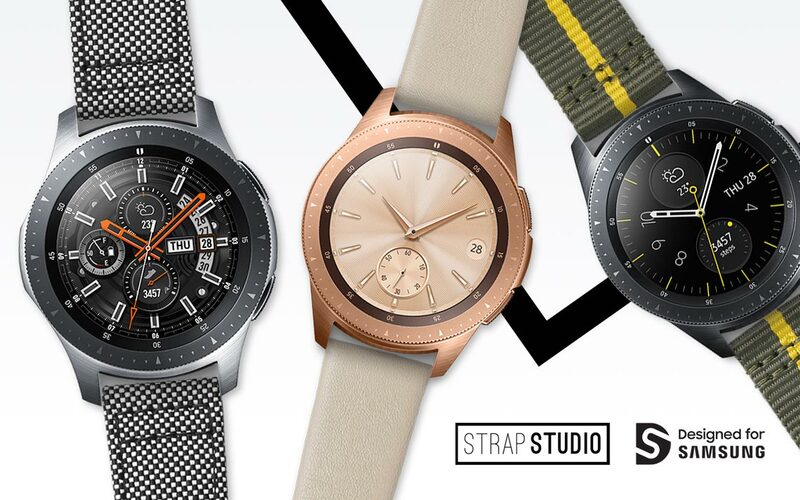 Strap Studio’s collection of specially designed watch straps made for the Samsung Galaxy smartwatch series are the definitive accessories for every type of watch wearer. Whether you’re in for the dark, deep, and mysterious colors and textures, or you’re looking for something to accentuate the elegance of your dress, these watch strap collections are always ready for you to wear with pride and confidence.